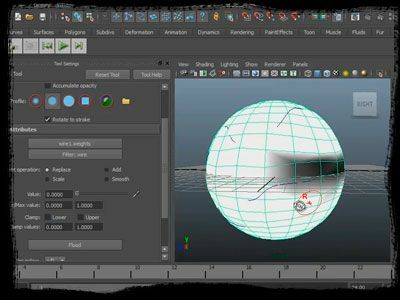 En anteriores entregas ya hemos explorado las opciones de las herramientas de deformación de Autodesk Maya. Esta vez, exploraremos más sus parámetros para poder utilizarlas con soltura para mejorar y ajustar la geometría final de nuestros objetos. Después de generar y aplicar los deformadores sculpt, wire y otros, observaremos como ajustar su radio de acción y la parte de la geometría sobre la que van a influir para obtener la mejor funcionalidad y deformar únicamente las zonas que deseemos sin modificar el resto. Una nueva ocasión de descubrir herramientas que a pesar de estar destinadas al apartado de la animación, nos servirán de ayuda inestimables a la hora de modelar cualquier elemento. Create a block with four portions and make it editable if important. Resize the shape so it is thin and proper for a hand. Presently select the <a href="http://www.pro-academic.co.uk/essay-writing-help/">UK Essays</a> four polygons over the highest point of the shape and expel them all up enough to give you a polygon aspect as an afterthought from which you can expel the thumb. Expel these four features again up to where the fingers are to begin. Create a block with four portions and make it editable if important. Resize the shape so it is thin and proper for a hand. Presently select the UK Essays four polygons over the highest point of the shape and expel them all up enough to give you a polygon aspect as an afterthought from which you can expel the thumb. Expel these four features again up to where the fingers are to begin. MBA in Dubai is a great way to get yourself ahead in your academic and career journey. It is through such kind of degree program that are meant especially for professionals and experts to help them improve their skills and their knowledge. Overall it is a perfect alternative for working professionals.